Some Christmas knitting, Jiu Bitsy ™ promotion day, and hello!?! A record player! My first three records make me seem a little schizo. Fleetwood Mac, Violent Femmes, and Neil Diamond. No, you really don’t want to see my mp3 library. It gets worse. Luckily, we have Half Price Books and I can get albums for only $4. I’m being picky, because you know I can go all crazy hoarder in 2.5 seconds. I’m also giving two huge boxes of yarn to a 13 year old. Bad color choices, bad yarn choices, left over Purling Dervish stuff, and OMG! WTF was I thinking yarn. I was going to ask if she liked cross stitch and maybe clear out some of that. I’m making room for fitness stuff. Our bikes, the weight bench, the stack of mats Santa brought. They’re kind of taking over the second bedroom. I don’t know either. Team Lutter at the Matshark tournament yesterday. Of course, after I rolled. They never take a picture before I get all sweaty and gross. I also may have forgotten my sock at home, so it didn’t get to go on an adventure yesterday. I wonder if I can take a bunch of them today to open mat and put them in BJJ positions. Results? Meh. I had two matches and I got silver. I really wanted to win and ended up in an Americana (the last picture shows the fun) and tapped a little later than I should have. 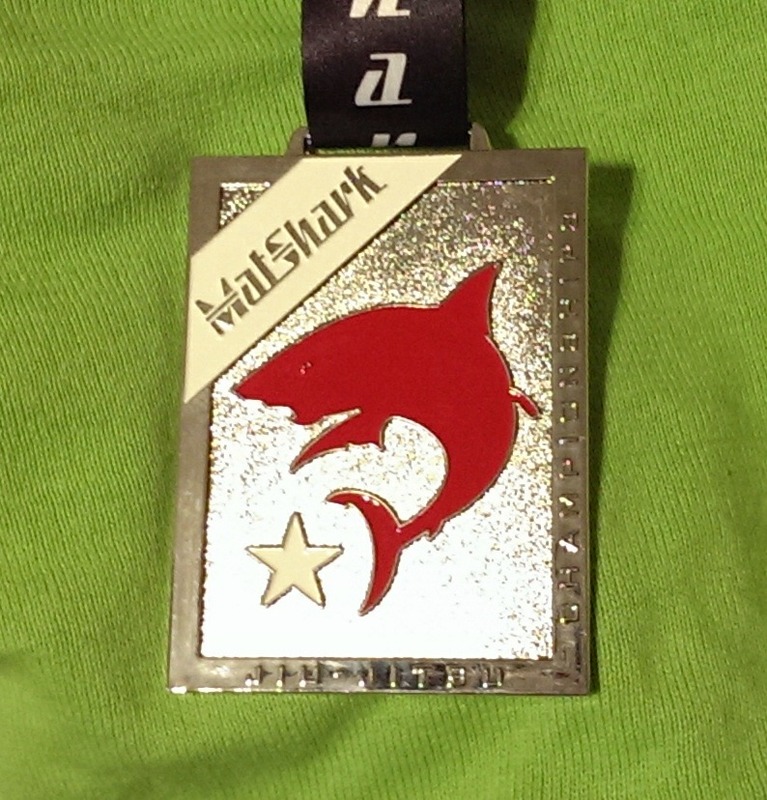 It was my floppy, so I wasn’t able to compete in the Absolute. Some ice, a compression sleeve, and the IF unit and I should be good to go by Monday. It’s been hot and I couldn’t train for about a week and a half. This could be a problem if I want to compete during the summer. (Unless we get mats and turn our living room into a mini dojo.) Not that it excuses not being good enough to win. Besides, the girl I lost to was like 19. Hello 22 year age difference! That’s an excuse I might be able to live with. I so want to prove a point. That even with the NMO and the floppy that I can do this. That I can be good. There are people missing limbs that win gold on an international level for Pete’s sake! I really get frustrated by my limitations. I’m not looking for comments on this, I just want to say a big EFF YOU to the situation getting in the way of my plans. Soooo… anyway! No sock knitting or spinning yesterday. I’m going to see what the day holds before I commit to doing anything besides going to the pool and napping. Happy Sunday y’all! What are you doing today? Yesterday was ranking day. Four and a half months in and I’m one stripe down. Yea! It usually takes about two years to get a blue belt, so I still have a ways to go. This means I can now attend advanced class which means more work and more practice for competitions. If you notice in the second class picture, while all of the girls were attacking our coach, the guys are standing around saying “Uh, uh. No way. Bobby will kick our asses if we get involved.” Obviously, we ladies have no fear. Thanks for all of the cheers and support so far. I know I still have a lot of work to do. I keep getting told to stop overthinking and just do. Not so easy when you “need” a plan for everything that could happen. I suppose it is a byproduct of my upbringing. I can tell you that it drives other people nuts sometimes. Hell, it even drives me a little batty. I need to stop and listen more. To my thoughts, to others and to my body. I need to not judge myself (or others) so harshly. I’m finding that the longer I do it, Jiu Jitsu is making me look at my character flaws rather than just my physical ones. I really thought it was just about challenging and changing my physical self. Ha! The joke is on me… in a good way. Happy Thursday y’all! What do you have planned for the long weekend? Day two was AH-mazing. It really doesn’t get better than a couple of professional, world champions teaching you. Especially women teaching women. It’s a different way of learning that I’m lucky I had the chance to experience. That’s after an hour and a half of rolling. I look like I got stuck in a rainstorm and hit by a truck. Some of those girls look shower fresh. How do they do it? I did sideways rolls down the mat twice! I am not the most coordinated person in the world as y’all may know (hello Floppy Paw Incident ’06). Rolls in general (forward, backward, and side) have left me feeling, well, uncoordinated. It felt good for it to click. They were warm ups for a couple of moves where you actually grab the other person and roll. Which brings me to the ribs. There, I am, on the back of another girl, arm around her neck. I was supposed to dip my shoulder to the mat, roll both of us and swing around quickly to catch her arm in an arm bar. At some point when I was scrunched up and pulling her over me, something popped. It didn’t hurt right away, but now? I’m just going to say I’m glad I brought some NSAIDs and the little man hooked me up with a bag of ice. It’s not broken. (Because, well, see that imaginary M.D. after my name?) I’m following google-fu’d instructions for breathing exercises, stretches, and icing. If it still hurts, I see my family doc this week anyway. Class starts at 10 today, and I’m debating either relaxing by the pool this afternoon or swallowing a bunch of my sleeping pills and heading home when I wake up sometime around midnight. Right now, the getting home early sounds good because tomorrow at 12, Texas and I are both getting new to us cars. I’d hate to get stuck in traffic and be late. 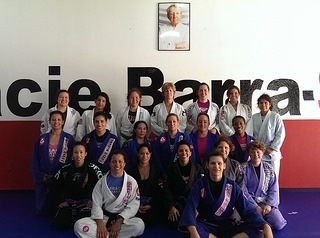 As some of you know, I am in San Antonio attending a Women’s BJJ Camp. 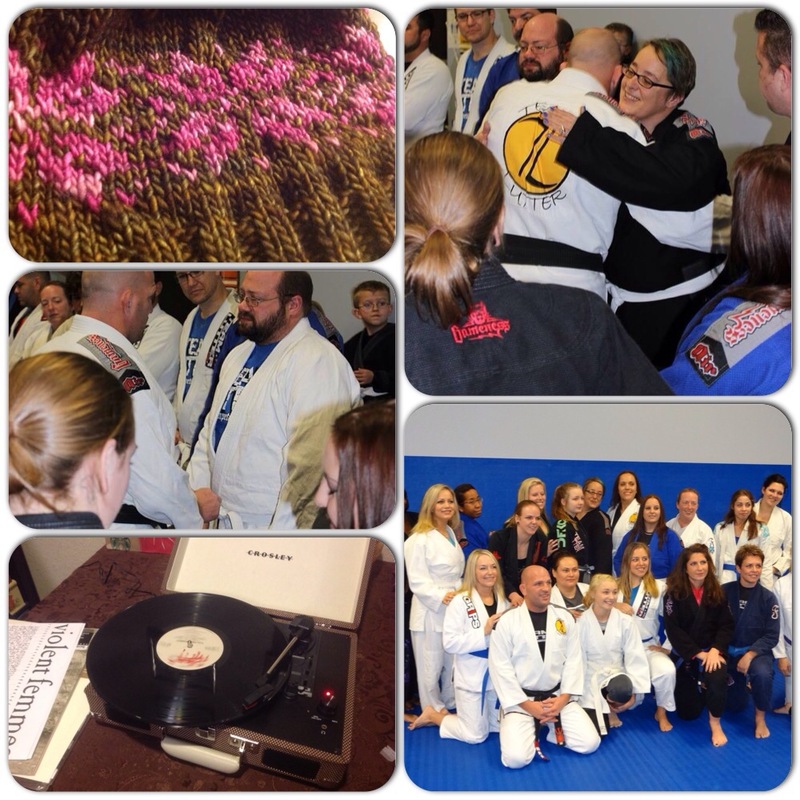 Fabiana Borges, Ana Laura Cordeiro, and Gracie Barra San Antonio are hosting the event. 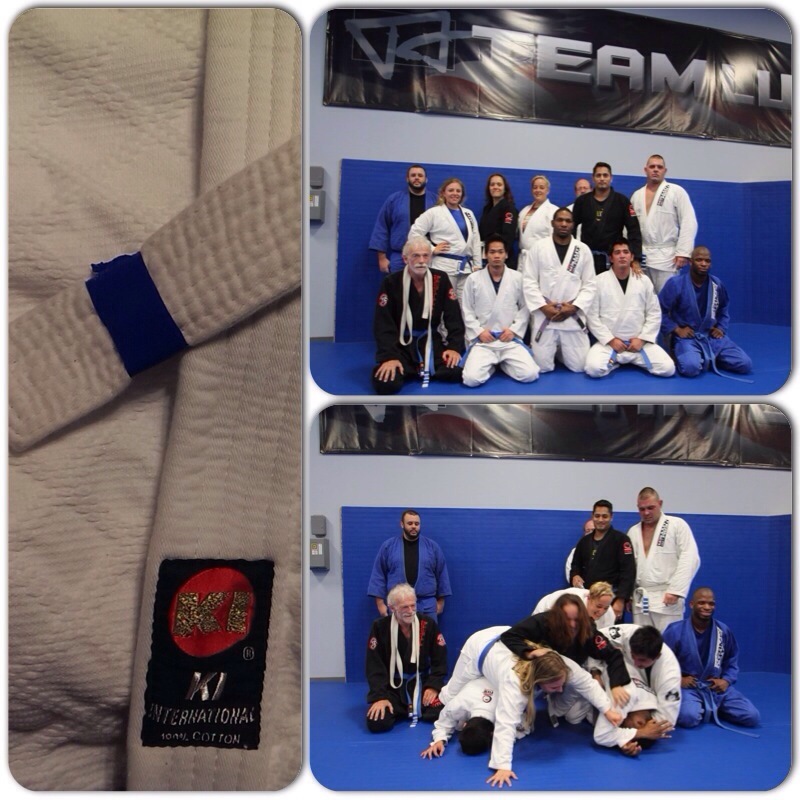 Last night was the first seminar led by Shama Ko, a phenom purple belt. She runs Girls in Gis and has a photography business. Besides the insane warm up, she was teaching a move on avoiding side control and then getting a submission. Image used from Eastern Europe BJJ. For those of you not in the know, side control is just what it sounds like. You are on your back and the other person is smashed into your chest and face from the side. Seriously, smashed. Yes, it usually as uncomfortable as that picture makes it look. It is my least favorite position to be in. I hate it even more than being mounted. I usually see it coming and just wait for the smash. No more! Well, hopefully no more. It was awesome meeting all of these strong, funny, confident, knowledgeable, amazing women. It was awesome seeing how different schools teach and learning new ways to do things. It was awesome rolling with only girls outside of a competition setting. It was just awesome. Don’t forget the Aminolast. Or I won’t last. Don’t be ashamed of my limitations. Don’t forget the cooling vest. Remind myself that I am new and that one day, I’ll understand what the heck is going on. A woman I was practicing with was talking about her 3 broken ribs and broken finger and she made the analogy “it’s not like we’re knitting here”. How appropriate. 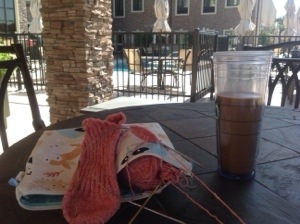 Because I am knitting here. I’m thinking of going for a swim before class. That is, if my bathing suit isn’t too big. There is a hot tub there too that has my name on it for this evening. Happy Saturday y’all! What are you doing today! p.s. I promise this is still going to be a knitting blog. I know it was a farm blog for a while and now it seems like BJJ all the time, but all things go in cycles.